How to combine segmentation to drive pop-up exposure to achieve granular exposure rules. Onsite Pop-ups was one of the first products ever launched at Nosto. With the recent additions of Segmentation and Insights product offering we saw a clear opportunity to extend the current targeting functionality to cater to a variety of customer lifecycle events. 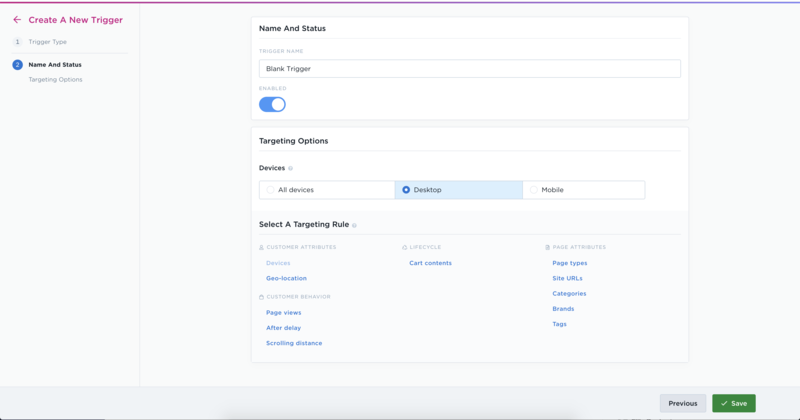 If an account has both Segmentation and Popups enabled, you can easily create re-usable triggers and segmented campaigns. 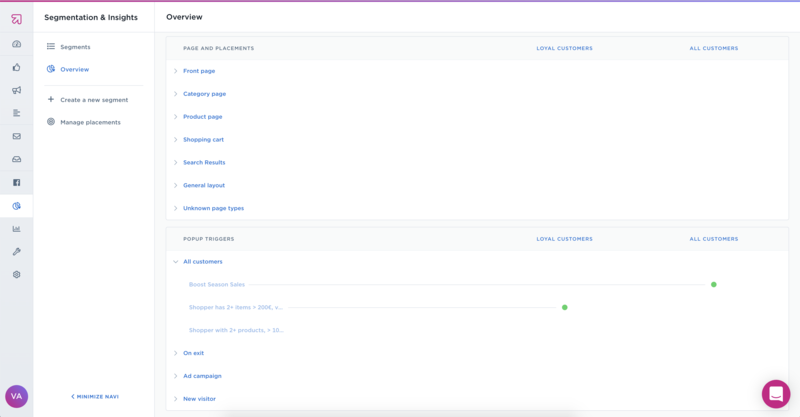 When navigating to Pop-ups a user will see three different sub-navigation items. Campaigns, Triggers and Settings. The trigger view houses all the re-usable triggers, and allows for creating new ones as well. 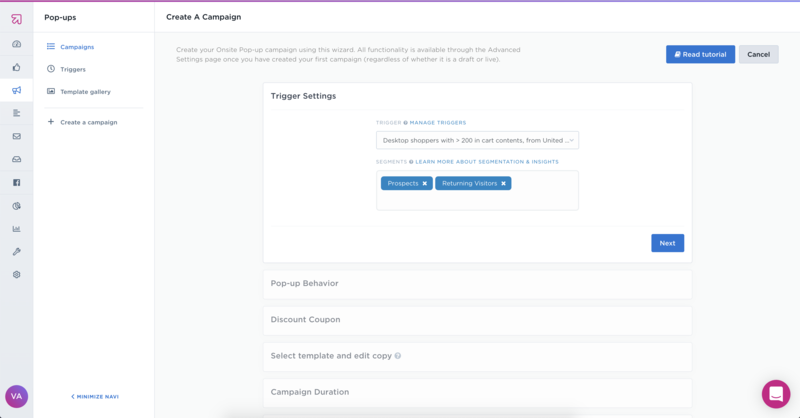 You can create your own triggers based on a multitude of rules, and even tailor individual campaign messaging for a user in the correct lifecycle state. When creating a new trigger, you first need to select your high level audience separator. And after this, apply different rules to make the targeting more granular. You can mix and match between many rules to create a trigger that serves your business needs. 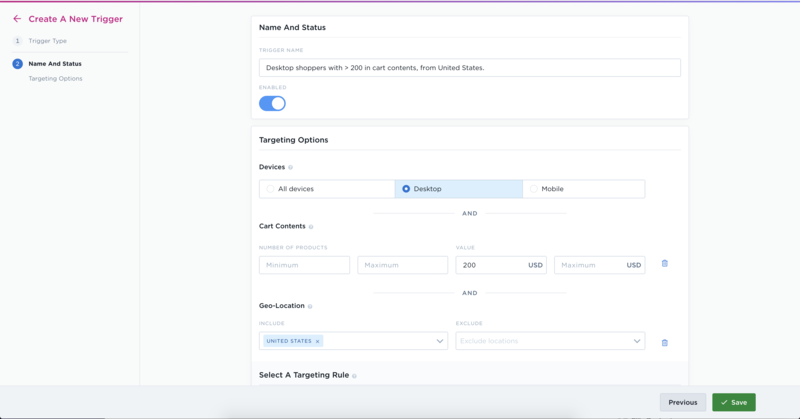 As an example, let’s create a trigger that only targets shoppers from the United States that have more than 200 USD in their shopping cart. 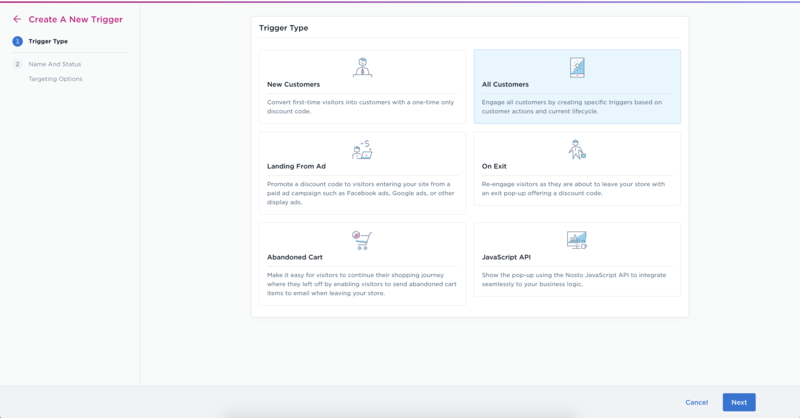 This trigger could be used to deliver a US-only discount whenever a certain threshold has been met to convert those high-value visitors. When the trigger is saved you can apply different campaigns to use it, and expose it towards different segments as well. Navigate to Pop-ups -> Campaigns -> Create New Campaign to create a new experience. In our example we further restrict the campaign to users who currently belong to the segments Prospects and Returning Visitors, to narrow down the exposure of the discount code to users who most likely come back to finalize a purchase. There are multiple strategies that can be used here. 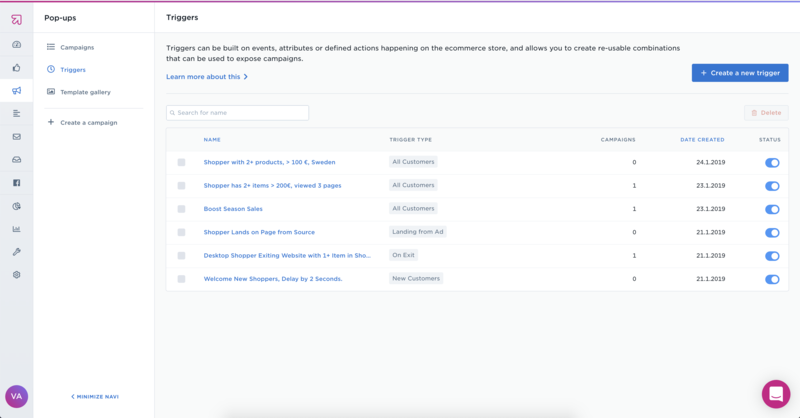 You can leverage all built-in segments found under Segmentations & Insights -> Segments or create your own custom segment combinations to achieve a wide variety of customer lifecycle messaging opportunities. Example: You want to expose a pop-up campaign only to your “Discounted Nike Fans” - segment. Leveraging segmentation can be a powerful way of narrowing down the influenced subset of audience so stores can further tailor their messaging, tone of voice and what discount codes are actually exposed. In the example above you don’t want to showcase a flat -20% on all items for the “Discounted Nike Fans” - segment, but rather highlighting what is going on with Nike products, or the latest sneaker drops coming out. Exposing multiple different pop-up campaigns spanning multiple triggers with different treatments for multiple different segments can become confusing quite fast. Hence we decided to streamline the experience and provide a visual summary of what onsite content, onsite product recommendations and onsite pop-ups that are active for different segments. 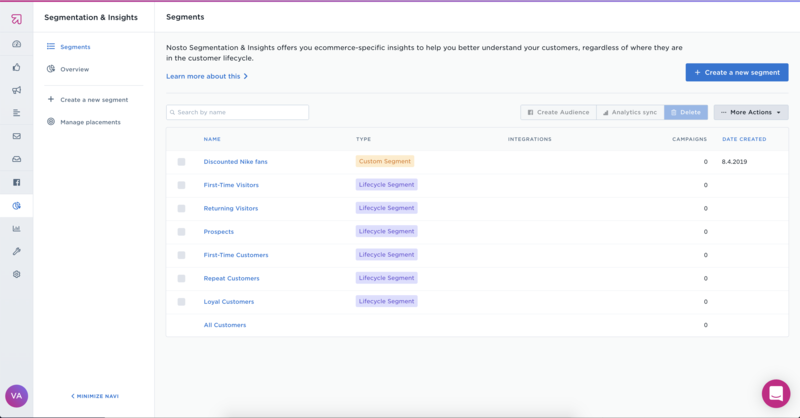 You can access the Segments Overview by navigating down to Segmentations & Insights -> Overview. Our help center has its own dedicated section to Segmentation & Insights, and its own article on the Experience Overview to guide you in how to best use these features.